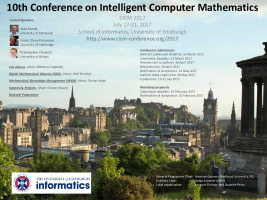 CICM is an excellent opportunity for graduate students to meet established researchers from the areas of computer algebra, automated deduction, and mathematical publishing. The Doctoral Programme provides a dedicated forum for PhD students to present and discuss their ideas, ongoing or planned research, and achieved results in an open atmosphere. It will consist of presentations by the PhD students to get constructive feedback, advice, and suggestions from the research advisory board, researchers, and other PhD students. Each PhD student will be assigned to an experienced researcher from the research advisory board who will act as a mentor and who will provide detailed feedback and advice on their intended and ongoing research. Students at any stage of their PhD can apply and should submit the following documents to the DP chair Adnan Rashid.